Every year I like to collect my thoughts on the Apple Watch and what software features are holding the product back. I did this for watchOS 3 in 2016 where I asked Apple to double down on health tracking, enable third party workout apps, improve communication options, improve the app ecosystem, and add third party watch faces. I then did it for watchOS 4 in 2017 where I asked for better media controls, better Activity sync in the cloud, podcast support, and third party watch faces. So now I’m back in 2018 with another list, and looking over these previous articles, it’s actually quite refreshing to see how many of these things Apple has addressed. It strikes me this year that we’re hitting the 5th major version of watchOS. This is not a brand new platform anymore, even though the Apple Watch feels relatively new in the grand scheme of things. Add to that the fact that Apple’s direct competitor here, Android Wear, has all but exited the market as Wear 2.0 barely got released and basically no one is making Wear watches anymore, and you get the feeling that watchOS updates don’t need to be that substantial anymore. The market is growing well for Apple, and they don’t have a competitor who is eating their lunch right now in terms of market share or functionality. Apple is basically the king of both sales and features when it comes to smart watches. There simply is not a better option out there today. Now that said, watchOS is far from perfect and there are tons of things that could be done to make it not only a better experience for those who already own one, but to draw in more people to the platform. The Apple Watch is one of the largest reasons I’m loyal to iOS for my smartphone, and since Apple is pretty darn invested in people buying more iPhones, they probably want to get people to love their Apple Watches even more so these customers never change sides. Without further ado, here are some of my suggestions to Apple that I think would make the Apple Watch a better, more appealing product. I also recorded a companion podcast episode about this topic. 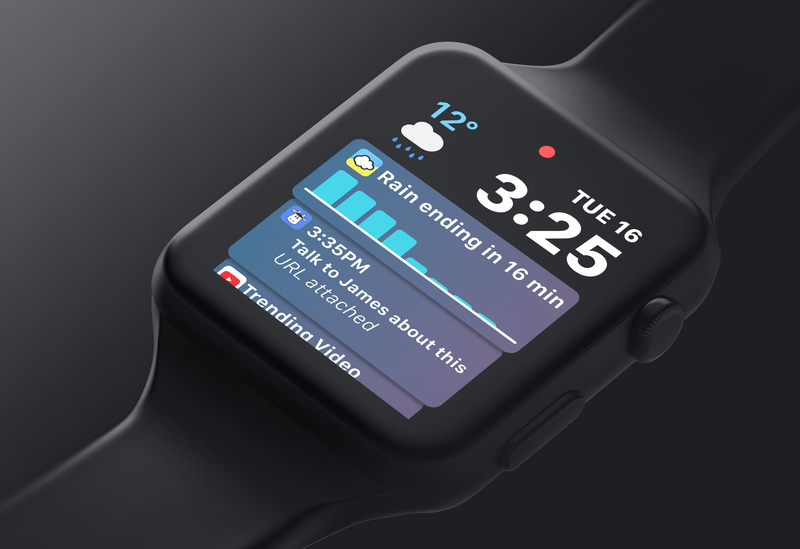 The number one thing I want from watchOS 5 is for third party apps to be able to tap into the Siri watch face. As I mentioned in my watchOS 4 review last year, the Siri watch face is one of the best additions to the Apple Watch last year. It’s one of my most used watch faces, especially when I’m at work and have a ton of items on my calendar. Being able to tilt my wrist and see the next couple events instantly is massively useful. Beyond calendars, the Siri watch face taps into a bunch of Apple’s own services like Reminders, Apple News, Weather, and more. This is nice, and I find these other apps to work well with the face in general, but I don’t use Apple’s own apps for a bunch of these things. I use Remember the Milk for my task management, not Reminders, so I never see my tasks on the Siri watch face. Likewise, the Weather app does an okay job of showing me the weather when the conditions are about to change, but I’d prefer a third party app to be able to pop up a card on the watch face when it’s about to rain, complete with a graph showing how much and for how long. Essentially, Apple should be making the Siri watch face the smartest, most useful watch face someone can choose. It already is the smartest, but to be useful to everyone, they need to make the apps people are actually using work with it. I ask for this every year and every year I’m disappointed, but I’ll ask anyway: please give us always on watch faces! Seriously, I charge my Series 3 LTE Apple Watch for about a hour or so every night. I then wear it from 10PM to around 8PM the next day. I can’t remember the last time I took this watch down below 50% in a 24 hour period. Hell, I went out of town on a Friday night and returned Sunday night and didn’t even bring my watch’s charger because I knew it would last. It did, and I probably could have made it to the next morning if I had needed to. Long story short, the battery is fantastic on the new hardware. Now Apple, please spend that battery surplus on always on watch faces! I don’t always need this, and the Apple Watch turns on 95% of the time when I want it to, but it’s not 100% and it is always a pain when it doesn’t turn itself on. With always on faces, I may not be able to see everything on the face, but at least seeing the time would be hugely useful. I’d also like to see third party developers have the ability to make their own watch faces. The watch faces included in watchOS are good, but they don’t fit the bill for everyone. I’d love to see what The Iconfactory, Tapbots, Flexibits, Snowman, or any number of other development houses would do with the opportunity to make their own faces. I’d like to see what fitness-focused faces RunKeeper or Nike or Adidas would come up with as well. Hell, even if it’s some sort of partnership thing where only a few developers make the cut and can release watch faces deemed good enough by Apple would be enough. I at least want to see new watch faces hit the Apple Watch between major watchOS releases, and I don’t want all of them to have to be made by Apple. Apple addressed a good number of my complaints last year by adding media controls in the Workout app, doing more seasonal badges, and backing up activity data to iCloud. This year there really isn’t a whole lot I think they need to do. That said, I would like them to add automatic workout detection. Some activity trackers do this already, and while it’s not perfect on any of them, it’s always good to have as a back up in case you forget to start or stop a workout. For example, if I start a run and forget to start a running workout on my Apple Watch, the watch should send me a notification after a minute that asks me if I am running and if I want to start tracking this as a workout. When I tap “yes” it should start a workout and know what type of workout I’m doing. I’d also like to see Apple add some winter activities to the Workout app. As someone who lives in the Midwest, I’d love to be able to select “Shoveling” as my workout, because believe me, that will take it out of you. I’d also add Ice Skating and Sledding to the mix. This may be getting a little greedy here, but I’d also like to see even more “seasonal” activity badges. They did a few more in 2017 than the year before, but people get really excited for these, and I think they can add a few more per year without them losing their specialness. It would also be cool of some of these achievements were competitions. Like one could be for a weekend 5K, and on Monday you could get a notification telling you how you did compared to everyone else in the world who participated in the run. That would be some next level activity tracking that some of their peers are doing already. Speaking of achievements, I love the move streak badge that I currently have a 78 days, but there really should be some sort of “rest day” function in here so I can take a break every so often. Sometimes people get sick and they can’t work out like they usually do. This isn’t a “failure” of the person to keep working out, it’s just a thing that happens to everyone. And yes, for the record I was sick exactly 79 days ago. I laid on the couch and watched movies all day because I was too sick to even sit up. It’s not the end of the world, but it’s silly to lose a long streak because you had the audacity to take it easy one freaking day. Finally, it would be nice to have watchOS track my sleep automatically. I currently use the app AutoSleep to do this, but a native option would be very convenient. Much like automatic workout detection, I would like the watch to automatically know when I go to sleep and wake up in the morning. Give us a podcast app! I have no specific requests at this point. You’d had 4 major releases with no way to play podcasts on the Apple Watch, so I’m literally take anything at this point. It would be nice to have smart syncing between my iPhone and Apple Watch so that my episodes were always available, and I wouldn’t hate it if third party apps like Overcast and Pocket Casts could make their own apps support local playback. I wish I was in a position to make specific requests, but I’ll take what I can get. And then there are a bunch of little things I think would make the Apple Watch a more pleasant product. Siri should always be listening for “Hey Siri,” thereby removing the need for me to raise my wrist to ask a question or make a request. Since Siri can now talk to you (at least on the Series 3) then it should be able to answer me without the need to ever look at the watch face. Apple does not use the same tools as app developers to make their apps, and that makes Apple’s built in apps better than third parties almost all of the time. Apple should update the frameworks and interface elements that third party developers can use to match what Apple themselves can do. This would lead to a better, faster, and more distinctive lineup of software for the watch. I’d love for third parties to be able to use their custom notification sounds that they have on iOS over on the watch as well. Right now everyone just uses the same “ding” sound. Improve the Dock with some sort of grid system or something. The new dock in watchOS 4 is not great, and is a definite downgrade from what we had before. The Breath app didn’t meaningfully change from it’s original version in watchOS 3, and I’d like to see it get updated with more guided meditation sessions. It could even get a dot in the activity rings too, in order to indicate whether you meditated that day. Ideally, third party apps like Headspace could tap into this and log meditations in this category. The Apple News app is nice, and I love its integration into the Siri watch face, but it does not let me read entire articles on the watch itself. I know it’s a bit odd, but it would be nice to be able to read more than just the first line of some articles without having to get my phone. I’d like to be able to see my iPhone’s battery life from my watch. Sometimes I’m away from my phone, or am just in a situation where my watch is more accessible than my phone and there have been many times when I wanted this but could not get it. As a bonus, it would be even nicer to be able to see the battery life of my AirPods at the same time. Note: Apparently the Apple Watch can show you AirPods battery status already. I don’t see it on my device through, which is weird, but it also why I didn’t know it was there! I should be able to select custom colors for the flashlight. Right now the options are white, flashing white, or red. That red one should be able to be configured to use whatever color I’d like. Theater mode should also set my watch to DND. Maybe this could be a toggle so people can do what they want here, but I always use this feature when I am either going to sleep or I’m actually in a movie theater. In both cases, I also don’t want to be buzzed while the mode is enabled. My final want is a crazy one, but I’d like the ability to watch YouTube videos on my watch. yes, this is stupid, and yes this is definitely not happening, but every once in a while I would actually like a video to play on my wrist and I can’t do it today. This would require Apple to make it possible and for Google to make it actually happen, and neither of those are likely, but hey, what are wishlists for? I don’t know how much of this Apple will actually do this year, but even knocking a few of these off my list of requests would make me very happy. watchOS is maturing, but it has so much more it can grow, so I hope Apple has a decent sized team working on their “most personal” device’s software this year. What do you think, though? Did I mention anything crazy? Did I miss something obvious? As always, you can let me know on Twitter!